Dame Agatha Christie wrote a number of classic crime thrillers and plays in her time. Along with the Miss Marple Mysteries, The Mousetrap is probably one of the most famous and also the longest running. Originally opening in 1952 at the Ambassadors Theatre in London, The Mousetrap held the record for longest running play and is now showing at St Martin’s Theatre, some 24,000 performances later. The Mousetrap is a murder mystery play of classic proportions with a twist in the tail which every audience is asked not to reveal to the public at the end of each performance. 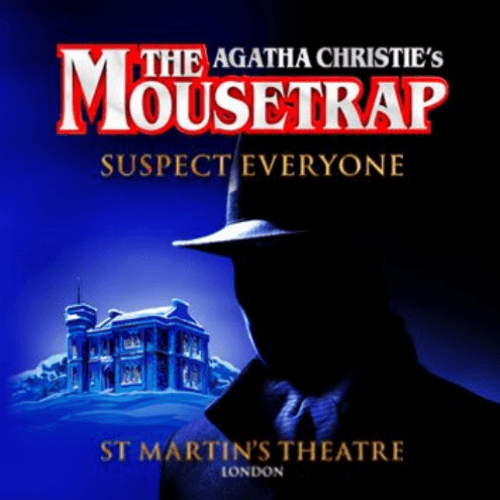 The Mousetrap has a classic whodunit plot – snowed in and stranded by a snowdrift at a hotel, the guests are suddenly in fear for their lives when Detective Sergeant Trotter arrives to tell them that a murderer is on the loose and may well be heading for the hotel. When one of the hotel guests is killed, it’s obviously that the murderer is among them. In true murder-mystery style, the guests re-enact the murder in order to discover the identity of the killer. Then a plot is hatched to set a trap. But with a twist in the end of the story, who could the killer be? The original play started off as a radio broadcast in 1947 before it moved to the West End. The Mousetrap is based on a short story written by Agatha Christie and based loosely on factual events (the death of a small boy who died while in foster care of a farmer and his wife). Helped along by the excellently crafted story, the mystery ending and the longevity of the play itself, The Mousetrap is a continued success and attracts tourist theatregoers simply because of its longevity. In fact The Mousetrap performed so well, it even surprised the original author. Dame Agatha Christie is quoted as predicting that her play would last no longer than 8 months. But when the news came in 1957 that it had broken the record for the longest running play at the time – Noel Coward even sent her a telegram of congratulations on the success. The Mousetrap has had a number of different cast members over the decades, with over 382 actors playing the various roles including Richard Attenborough. Being the longest running play, The Mousetrap has broken a number of records including the record for ‘Most Durable Actor’ with David Raven playing the same part for 4574 performances (to put that into perspective, if it was one performance per day, that’s 12 years of solid performances!). Previous audiences sworn to secrecy have included many special guests including the Queen and the Duke of Edinburgh. Join the historic line of people to have watched The Mousetrap by booking tickets online through CompareTheatreTickets.com. Just remember not to spoil the ending for everyone else!